But first, here’s a brief history: Chap books were sold by chapmen (hence the name chapbook) on street corners, door to door, or at countryside markets and fairs in Europe. People were just starting to read, so they were eagerly sought. The books were usually folded into 8,12,16, or 24 pages, and made of such poor quality paper that the pages might be used as a toilet paper when the reader was finished. Subject matter included, almanacs, folk takes, ballads and popular songs, political and religious tracts, bawdy tales, and moral instruction. A zine I made based on vintage photos from the 1940’s of Yosemite. Zines are frequently irreverant and counterculture, concentrating on anything from punk rock to pez dispensers, or from feminism to other political subjects or cartoons. They are often deeply personal, and one rarely makes money from them. Yet, individuals keep making them! Both chapbooks and zines are simple to make. You simply nest four or five folded pages and attach (either using a stapler, or needle and thread and a binding method called the “pamphlet stitch”) to a heavier piece of paper for the cover. And why do people get such a kick out of making their own books. I asked Johnna Schmidt of the University of Maryland, who directs a two year creative writing residential program there–mostly for upper classman. During their last semester they learn how to simply bind a book of their own writings. “The experience of curating your best work in order to make a book…is a real act of commitment. I think it sharpens for people their idea of who they are and what is important to them… A book that you have hand-made inevitably becomes a sacred object, ” she says. A library in the small town of Zutphen (located in the eastern part of the Netherlands) with chained books. The concept of a book as a sacred object is not new. During medieval times large portions of the population were becoming literate so books were very much desired, but were also expensive. What’s a library to do to keep books from being stolen, yet allow the community access to them? The solution was simple: Chain the books to a railing. Some of these libraries still exist. Yet despite these extreme measures, keys to the front door were often give to the town canons or monks, and sometimes to the townspeople so they could have easy access to library. 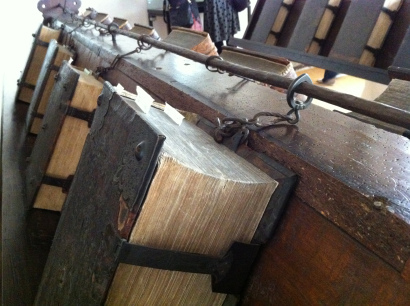 Books were sacred but the town fathers also wanted to give the community access to these chained books. Peggy on Do We Still Need Wedding Albums? Rhona on Do We Still Need Wedding Albums? Judy on Do We Still Need Wedding Albums?